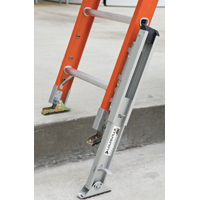 The all-steel Ladder Stand-Off makes any job working with ladders easier. 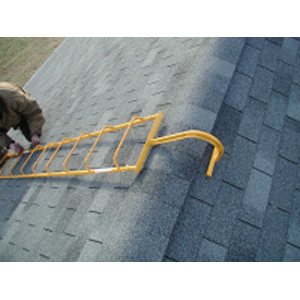 It keeps your ladder away from gutters and buildings, allows working in corners, and supports your ladder against a wall or roofline. 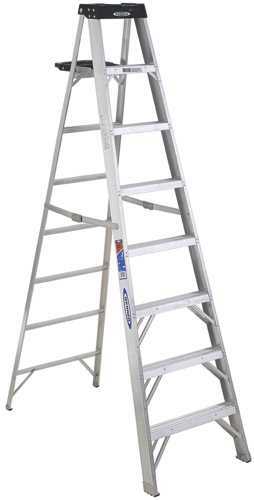 It is adjustable for different eave widths (22n8-28n8) and different ladder widths. 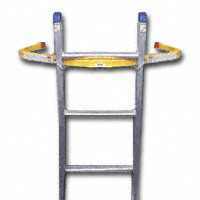 No additional hardware is required to put it on or take it off, and it locks in place with body weight on the ladder for extra stability. FIBERGLASS STEP STOOL Type I-250 lb. 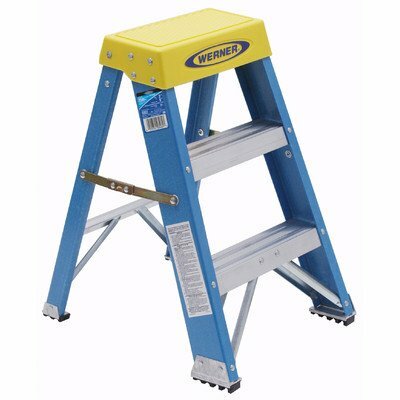 duty rating Heavy duty/industrial use Blue electrically non-conductive rails Molded top provides large platform Slip-resistant traction-tred steps Plated steel braces on top & bottom Combination rail end shield/foot pad External pinch-proof spreaders 6002 2 FT. FIBERGLASS STEP STOOL SIZE:2 Ft. STEP RIGHT(R) UTILITY STEP STOOL Lightweight design, easy to use and store 3-step model with secure oversized - slip-resistant steps Mar-resistant feet - Comfortable tubular rails Convenient hand grip Height to platform: 2 ft. 4" Rail length: 30" - approximate width 18-1/2" Approximate spread 25-9/16" - weight 13 lb. 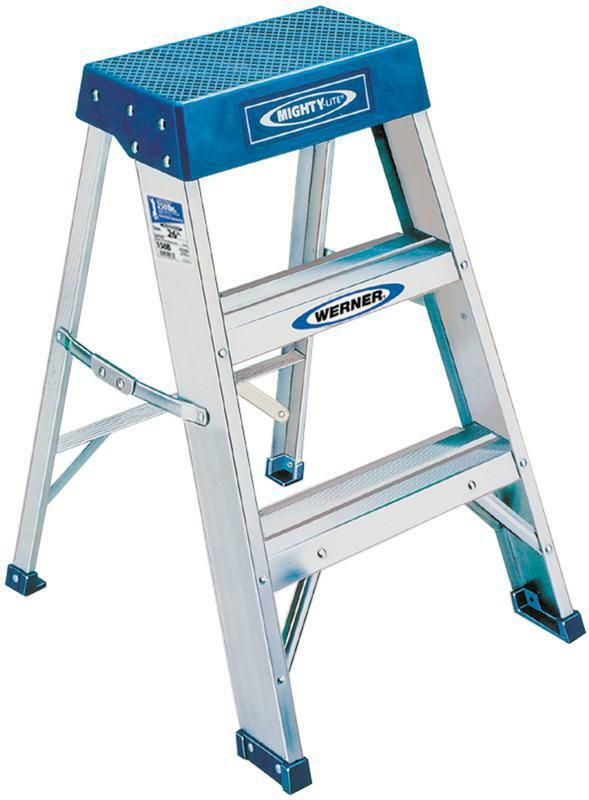 223-6 3STEP TYPE II STEP STOOL DESC:Type II LOAD CAPACITY: 225 Lb. 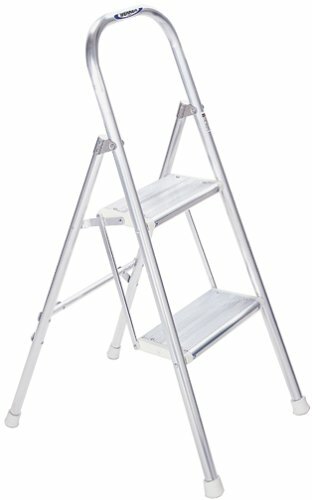 ALUMINUM UTILITY LADDER Type III-200 lb. 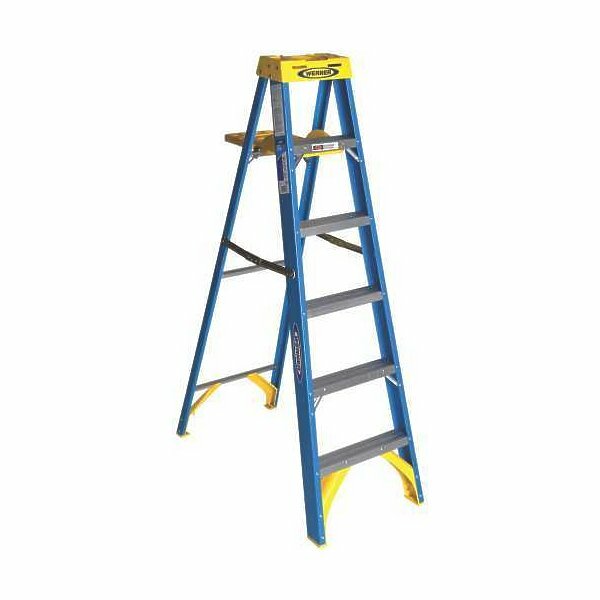 duty rating Easy action open-close Slip resistant steps Mar-resistant rubber tip feet Folds to 3" for easy storage Wide angle stance 244 4 FT. SAF-T-MATE UTIL LADDER SIZE:4 Ft.
FIBERGLASS STEPLADDER Type I duty rating - 250 lb. load capacity Heavy duty/industrial use Blue electrically non-conductive rails Tool-Tra-Top tray for paint/tools Braces on top/bottom steps & horizontals Sturdy paint can hanger/pail shelf w/rag rack External pinch-proof spreaders Combination rail end shield/foot pad 6006S 6 FT. 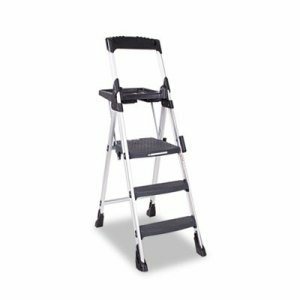 TYPE I FG STEP LADDER SIZE:6 Ft.
ALUMINUM STEP STOOL Type IA duty rating -300 lb. 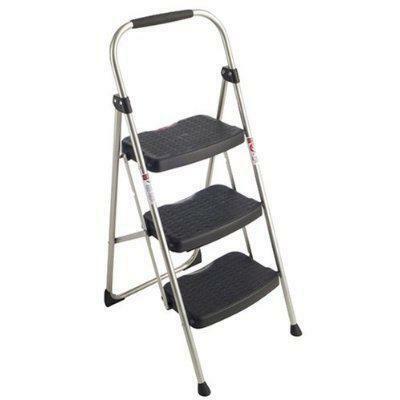 load capacity Heavy duty/ industrial use Molded top provides large standing platform Molded vinyl foot pads riveted to rails Slip-resistant traction-tread steps Bottom step has double channel braces Ideal for industry, office & home applications Not for use around electricity 150B-2 2 FT. IA ALUM STEP STOOL SIZE:2 Ft. 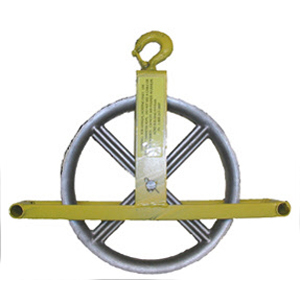 This lightweight 12 inch aluminum wheel with dual-roller bearings and a grease fitting in a sturdy all-steel frame conveniently converts your ladder into a hoist. 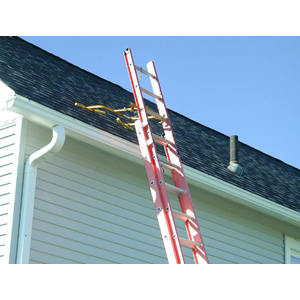 The 79000 mounts on any two rungs of a ladder and, using a 3/4 or 1 inch manila rope, lifts up to 300 pounds of supplies to your roof. The handle is 24 inches from the ladder mounting point, and it stays in place and won't sway or wobble. 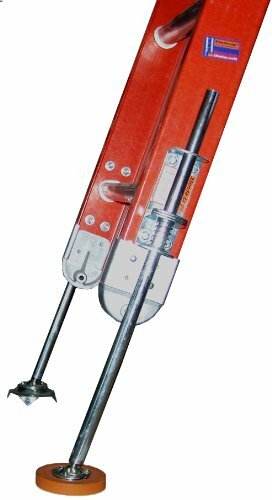 TOOL-TRA-TOP TWIN STEPLADDER Type IA - 300 lb. 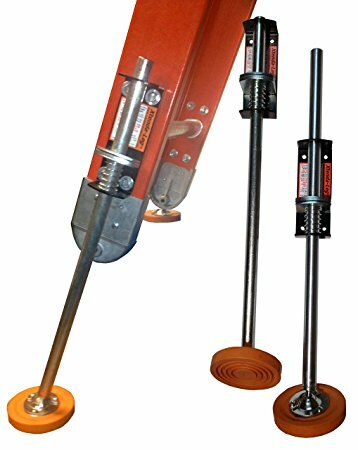 duty rating Heavy-duty fiberglass rails Tool-Tra-Top includes: Dual drill holsters, tool & paint can holders Small parts tray Ideal for one or two person jobs Drill not included T6203 3 FT. IA FG TWIN STEPLADDER SIZE:3 Ft.
Bolts easily to extension ladders. 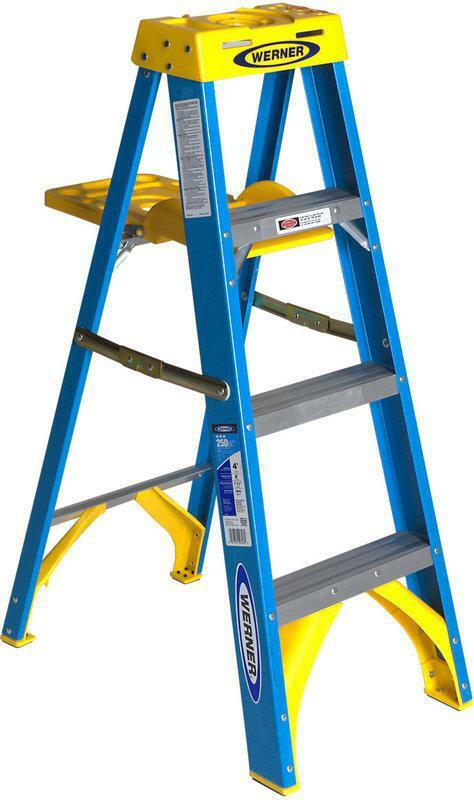 Recommended for use only with Type 2 or better ladders, not A-frame ladders. Feet may be replaced in two parts: the pads, and the hardware that holds the pads. This lightweight 12 inch aluminum wheel with dual-roller bearings and a grease fitting in a sturdy all-steel frame conveniently converts your ladder into a hoist. Using a 3/4 or 1 inch manila rope, the 79005 lifts up to 300 pounds of supplies to your roof. 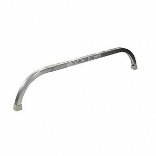 Its heavy-duty forged swivel hook has a safety latch for added security. 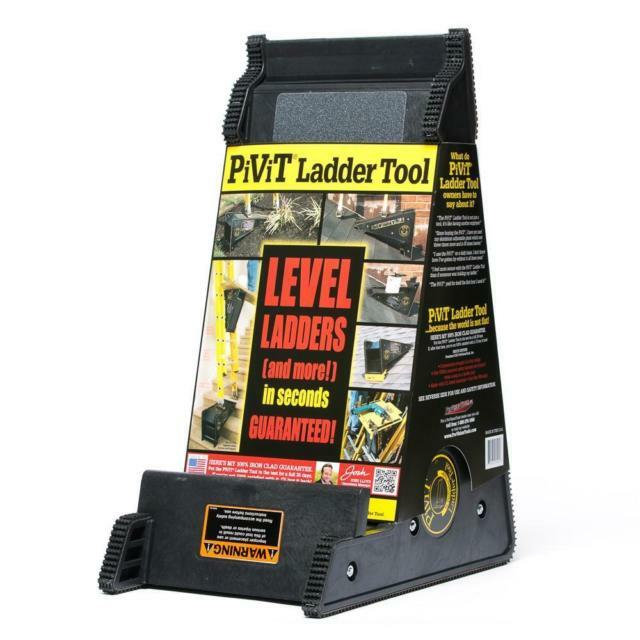 Lightweight aluminum frame supports three large heavy-duty injection molded polypropylene resin steps. Extra-large 16 1/4w x 16 1/4d top platform step. 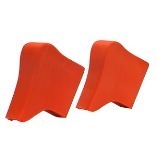 Large, non-marring, skid-resistant feet provide stability. WARNING: Metal ladders conduct electricity. Do not use where contact may be made with live electrical circuits. 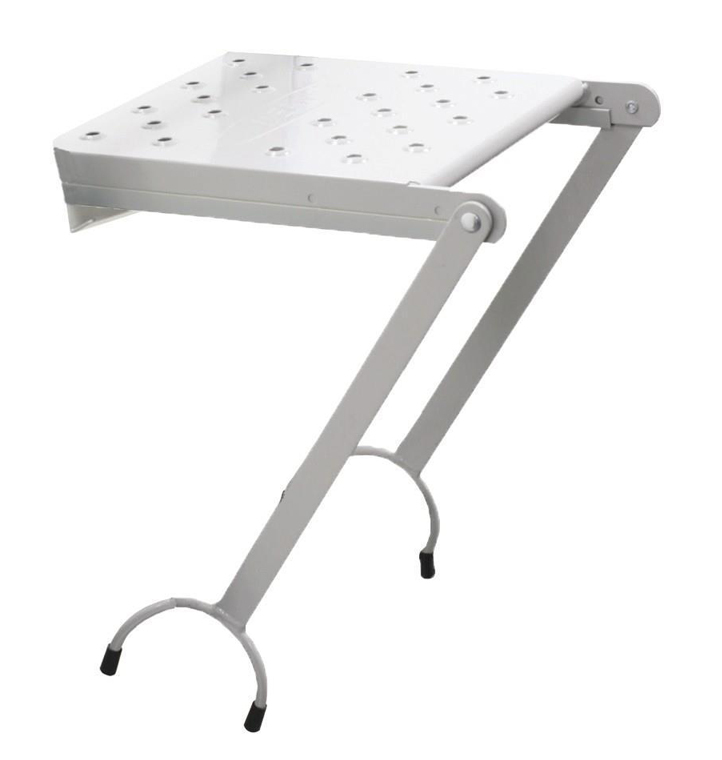 Number of Steps: 3; Step Stools Type: Folding Step Stool; Frame Material: Aluminum; Step Material: Polypropylene. 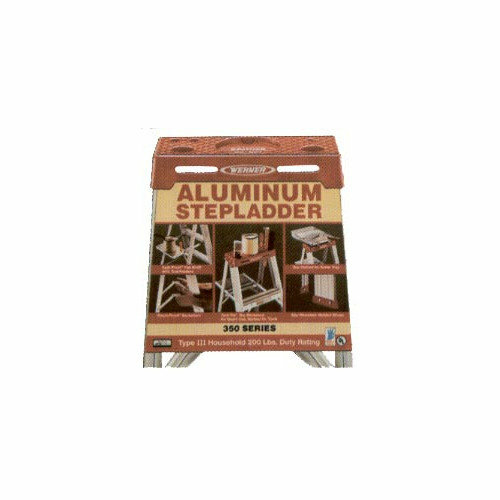 ALUMINUM STEPLADDER Type II-225 lb. 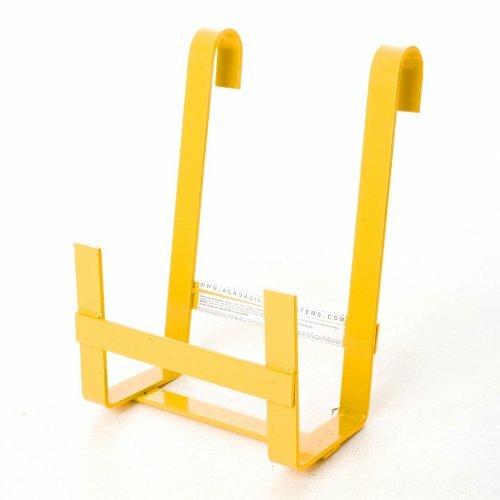 duty rating Tool-Tra-Top tray for tools & paints Slip-resistant traction-tred steps Braced bottom & top steps Slip-resistant molded foot pad Spill-proof pail shelf Shelf holds gallon paint can 354 4 FT. 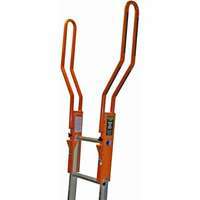 TYPE II ALUM STEPLADDER SIZE:4 Ft. 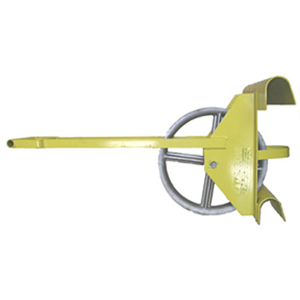 Ladder Accessories - Ladder Scoop. 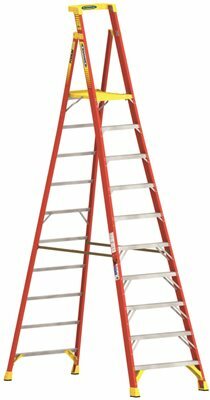 FIBERGLASS STEPLADDER Type I duty rating - 250 lb. load capacity Heavy duty/industrial use Blue electrically non-conductive rails Tool-Tra-Top tray for paint/tools Braces on top/bottom steps & horizontals Sturdy paint can hanger/pail shelf w/rag rack External pinch-proof spreaders Combination rail end shield/foot pad 6004S 4 FT. TYPE I FG STEP LADDER SIZE:4 Ft.
WERNER� TYPE IA ALUMINUM PODIUM LADDER, 10 FT. WERNER� TYPE IA ALUMINUM PODIUM LADDER, 10 FT. 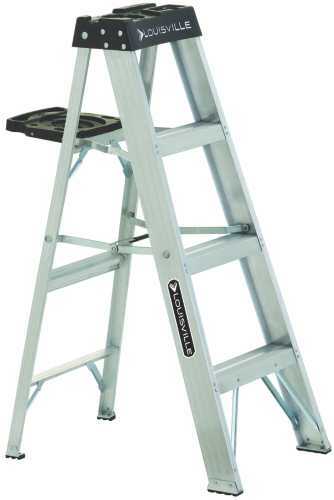 The NEW PD6210 Podium Ladder offers the same reach height as a 12 ft stepladder and is ideal for working at fixed heights and is easier to maneuver than scaffolds or lifts. The extra-large platform with toe guard feels like you are standing on the ground and 4X Work Zone allows you to work facing any direction. 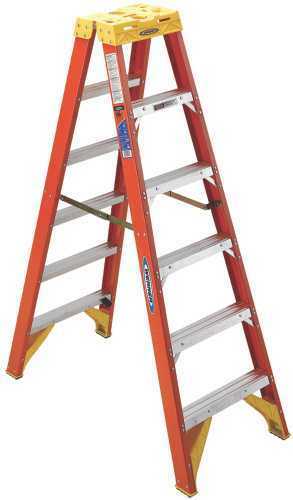 This ladder features full aluminum bracing and a full set of rear horizontals. 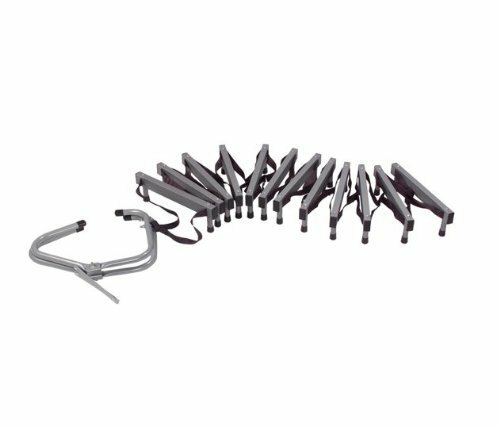 The LOCKTOP� extended guardrail provides an extra point of contact and conveniently organizes tools and accessories. 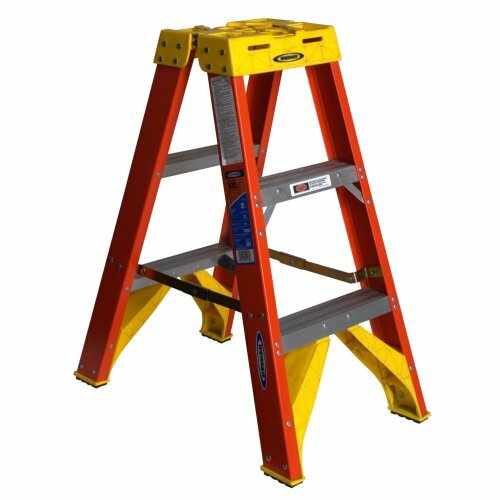 The newly designed EDGE360� gives the bottom of the ladder protection from every angle with integrated rail shield, EDGE bracing and over-sized foot pads.